After the BetaFPV Beta85X and Happymodel Mobula7, we are happy to introduce you another power Whoop called GoFly Scorpion 80. As you can guess from its name, it is built on an 80 mm sized frame. Like most of the breathless Whoops, the GoFly Scorpion 80 is powered by a 2s LiPo battery. According to your existing transmitter you can opt for DSMX, FlySky FS-RX2A or FrSky XM radio receiver. 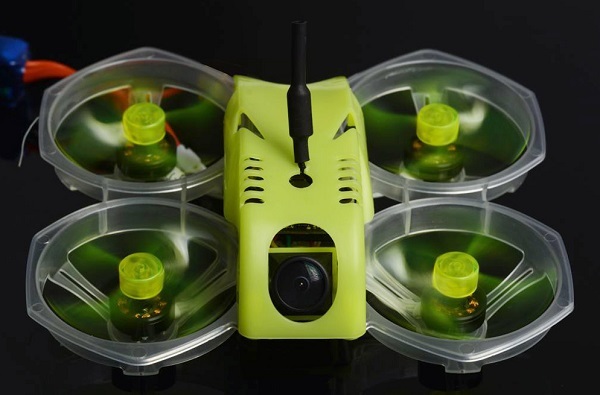 As FPV system, GoFly opted for the popular Caddx Turbo Eos2 FPV camera. The 5.8G/40CH video transmitter features SmartAudio (VTX telemetry) and adjustable broadcast power (25 or 100mW). The motors are 11000KV rated and they have a 1.5mm shaft. They should provide plenty of punch together with those GemFan 1636 props. Weight: 41 grams (without battery and receiver). While BNF package requires only battery and compatible transmitter, the PNP package requires additionally radio receiver. For FPV flights you will also need FPV goggles.